Modern photo arts are perfect for any interior. They are made from high quality materials that last for centuries. Their creation takes just a few minutes. No program installation is required to create photo arts online. Each format is designed for horizontal or vertical pictures and can be hung both ways. 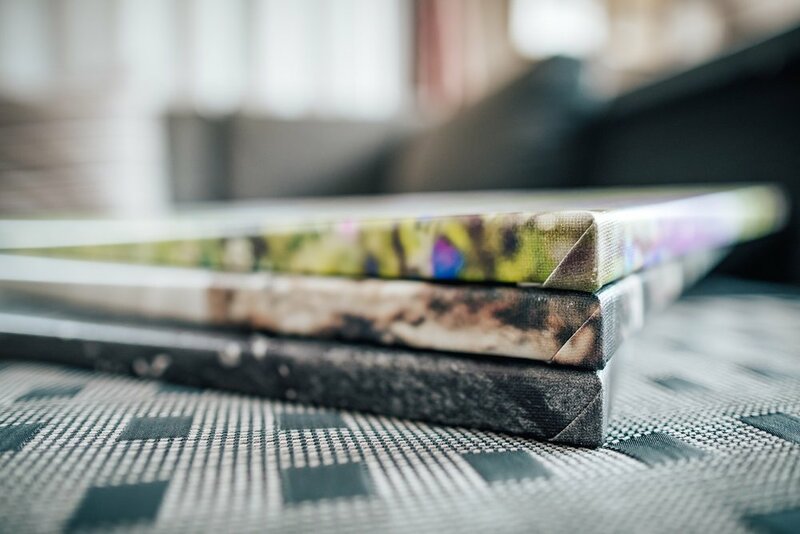 Photos are printed on Ritmo Canvas Semi-Matt 340 g with a textured surface. The texture gives the photo art an artistic effect. The flexibility of the material prevents the canvas from wrinkling and ensures it stays well stretched on the frame. The canvas is of ivory colour. The canvas is stretched over a sturdy wooden frame. The frame is 1.9 cm thick and the lath is 4.5 cm wide. These dimensions ensure that the frame does not bend or twist. We use high quality dry wood for manufacturing the frames. The corners of the frame are reinforced by small wedges. The larger frames are stabilised by parallel bars. The slightly raised outer edge of the frame protects the inner edge of the frame from being embossed into the canvas. Folds around the corners of the frame are designed to be as hidden as possible. Photos are printed with eco-friendly hygienic latex colours. Producers of the printing colours guarantee their paints last hundreds of years.